Cotidal lines are lines on a map which connect points at which the same tidal level occurs simultaneously. Isaac Newton had explained the movement of the tides by the action of the moon and sun, and Daniel Bernoulli had used Newton's findings to create tide tables for specific locations, but William Whewell wanted to take research further by gathering and analysing information which would link cotidal points or lines across the world. Fellow and eventually Master of Trinity College, Cambridge, Whewell (1794-1866) published this work in 1833. 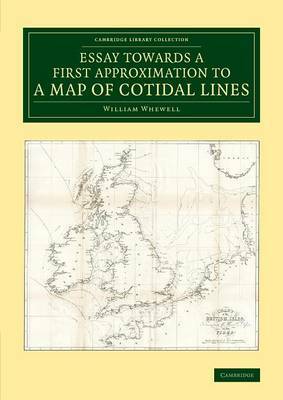 In it he proposes various observations that would need to be undertaken to produce a cotidal map, with detailed descriptions of the factors to be taken into account in computing the results. In 1837, Whewell, several of whose other works are also reissued in this series, was awarded a royal prize medal by the Royal Society for his work on 'tidology'.